17:0.10 These seven orders are known on Uversa as the seven Supreme Spirit groups. Their functional domain extends from the personal presence of the Seven Master Spirits on the periphery of the eternal Isle, through the seven Paradise satellites of the Spirit, the Havona circuits, the governments of the superuniverses, and the administration and supervision of the local universes, even to the lowly service of the adjutants bestowed upon the realms of evolutionary mind on the worlds of time and space. 17:0.11 The Seven Master Spirits are the co-ordinating directors of this far-flung administrative realm. In some matters pertaining to the administrative regulation of organized physical power, mind energy, and impersonal spirit ministry, they act personally and directly, and in others they function through their multifarious associates. In all matters of an executive nature—rulings, regulations, adjustments, and administrative decisions—the Master Spirits act in the persons of the Seven Supreme Executives. 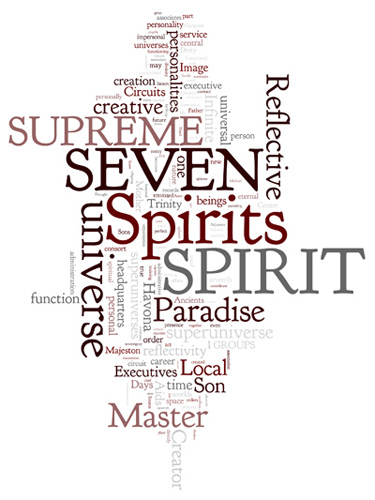 In the central universe the Master Spirits may function through the Seven Spirits of the Havona Circuits; on the headquarters of the seven superuniverses they reveal themselves through the channel of the Reflective Spirits and act through the persons of the Ancients of Days, with whom they are in personal communication through the Reflective Image Aids. 17:0.12 The Seven Master Spirits do not directly and personally contact universe administration below the courts of the Ancients of Days. Your local universe is administered as a part of our superuniverse by the Master Spirit of Orvonton, but his function in relation to the native beings of Nebadon is immediately discharged and personally directed by the Creative Mother Spirit resident on Salvington, the headquarters of your local universe. 17:3.8 Everything of import transpiring on a local universe headquarters is inherently reflected to the capital of its superuniverse. And conversely, everything of local universe significance is reflected outward to the local universe capitals from the headquarters of their superuniverse. The reflectivity service from the universe of time up to the superuniverses is apparently automatic or self-operating, but it is not. It is all very personal and intelligent; its precision results from perfection of personality co-operation and therefore can hardly be attributed to the impersonal presence-performances of the Absolutes. 17:6.3 1. Initial Paradise Differentiation. When a Creator Son is personalized by the joint action of the Universal Father and the Eternal Son, simultaneously there occurs in the person of the Infinite Spirit what is known as the “supreme reaction of complement.” We do not comprehend the nature of this reaction, but we understand that it designates an inherent modification of those personalizable possibilities which are embraced within the creative potential of the Conjoint Creator. The birth of a co-ordinate Creator Son signalizes the birth within the person of the Infinite Spirit of the potential of the future local universe consort of this Paradise Son. We are not cognizant of this new prepersonal identification of entity, but we know that this fact finds place on the Paradise records of the career of such a Creator Son. 17:6.5 3. The Stage of Physical Creation. At the time the creatorship charge is administered to a Michael Son by the Eternal Son, the Master Spirit who directs the superuniverse to which this new Creator Son is destined gives expression to the “ prayer of identification” in the presence of the Infinite Spirit; and for the first time, the entity of the subsequent Creative Spirit appears as differentiated from the person of the Infinite Spirit. And proceeding directly to the person of the petitioning Master Spirit, this entity is immediately lost to our recognition, becoming apparently a part of the person of this Master Spirit. The newly identified Creative Spirit remains with the Master Spirit until the moment of the departure of the Creator Son for the adventure of space; whereupon the Master Spirit commits the new Spirit consort to the keeping of the Creator Son, at the same time administering to the Spirit consort the charge of eternal fidelity and unending loyalty. And then occurs one of the most profoundly touching episodes which ever take place on Paradise. The Universal Father speaks in acknowledgment of the eternal union of the Creator Son and the Creative Spirit and in confirmation of the bestowal of certain joint powers of administration by the Master Spirit of superuniverse jurisdiction. 17:6.7 4. The Life-Creation Era. Upon the declaration of intention to create life by the Creator Son, there ensue on Paradise the “personalization ceremonies,” participated in by the Seven Master Spirits and personally experienced by the supervising Master Spirit. This is a Paradise Deity contribution to the individuality of the Spirit consort of the Creator Son and becomes manifest to the universe in the phenomenon of “the primary eruption” in the person of the Infinite Spirit. Simultaneously with this phenomenon on Paradise, the heretofore impersonal Spirit consort of the Creator Son becomes, to all practical intents and purposes, a bona fide person. Henceforth and forevermore, this same local universe Mother Spirit will be regarded as a person and will maintain personal relations with all the personality hosts of the ensuing life creation. 17:6.9 6. The Ages of Light and Life. Upon the establishment of the era of light and life the local universe cosovereign enters upon the sixth phase of a Creative Spirit’s career. But we may not portray the nature of this great experience. Such things pertain to a future stage of evolution in Nebadon. 17:7.1 These adjutant spirits are the sevenfold mind bestowal of a local universe Mother Spirit upon the living creatures of the conjoint creation of a Creator Son and such a Creative Spirit. This bestowal becomes possible at the time of the Spirit’s elevation to the status of personality prerogatives. The narration of the nature and functioning of the seven adjutant mind-spirits belongs more appropriately to the story of your local universe of Nebadon.